Coronation Park is just west of Westmount Mall. The park entrance is where 114 Avenue meets 139 Street. From 142 Street turn right/east onto 115 Avenue. At the 4-way stop, turn right/south onto 139 Street. 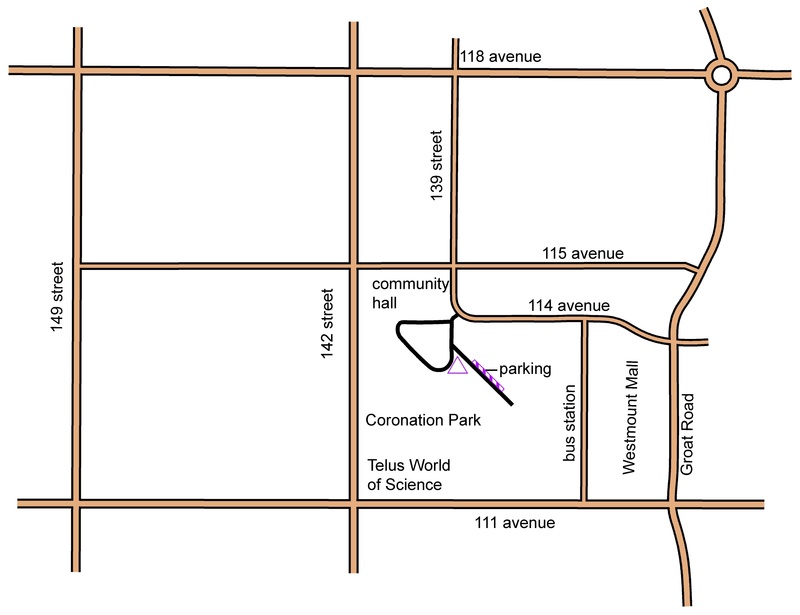 The entrance to the park is on the right where the road changes to 114 Avenue. In the park stay to the left (follow orienteering signs). There are 51 angle parking spots on the left. There are public washrooms in the food court of Westmount Mall. Seasonally, there are public washrooms on the south side of the tennis courts. Restaurants: McDonald’s, Tim Hortons, Boston Pizza on the Groat Road side of the Mall; the food court is accessible from the west side of the Mall.